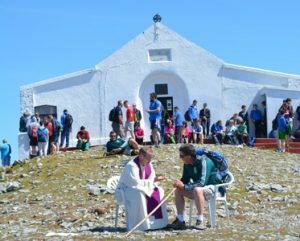 Over 100 young people took part in the annual Tuam diocesan youth council pilgrimage on Saturday to the summit of Croagh Patrick where Mass was celebrated. The group was joined by the Papal Cross group from Elphin who were led by Bishop Kevin Doran as well as Permanent Deacon Frank McGuinness and the chaplain to Summerhill College, Fr Cryan. 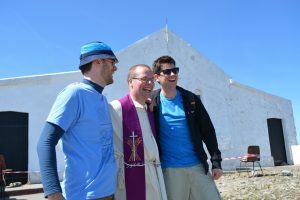 Fr Shane Sullivan was homilist for the special Mass on the summit. The climb was organised by the diocesan youth council under the guidance of the youth officer Siobhán Bradley. Croagh Patrick (2,510ft/765m), Ireland’s holy mountain, dominates the landscape of southwest Mayo both spiritually and physically. The Croagh Patrick pilgrimage is associated with St Patrick who, in 441, spent forty days and nights fasting on the summit, following the example of Christ and Moses. The name ‘Reek Sunday’ comes from Patrick’s ability to Christianise many pagan customs including the festival of Lughnasa, which previously had heralded the start of the harvest festival honouring the ancient pagan god Lugh, whose name is encompassed in the Irish word for August: Lughnasa.